It is with great pleasure that I open up today’s blog for the 2nd annual Latinas for Latino Lit Día Blog Hop. The drive behind the blog hop is to showcase Latino authors/illustrators to honor Día de los Niños, Día de los Libros which is greatly celebrated on the 30th of April. The blog hop is nearing its end and this year 24 top Latina Bloggers from all over the nation have featured Latino authors/illustrators that opened up the world of Latino Lit and today, Family is Familia is participating. Click on the image for more info about Dia Blog Hop 2014! Have you ever noticed how a certain taste or smell brings back a special memory? For me, freshly cooked pinto beans–los frijoles bring back my childhood and my mother Lupe’s kitchen. Even today, everyone loves my mother’s kitchen, her Mexican food, and especially her beans. She cooks them in a magical pot, because the beans disappear so quickly! An earthy bowl of beans, ancient food of the Americas, feeds both my hunger and my soul. With each spoonful or scoopful of tortilla, beans nourish our collective hunger for traditions, cultural practices, and shared history. Yes, a simple bowl of frijoles, homemade tortillas, and spicy salsa, stir up family stories of rich aromas and spicy flavors. 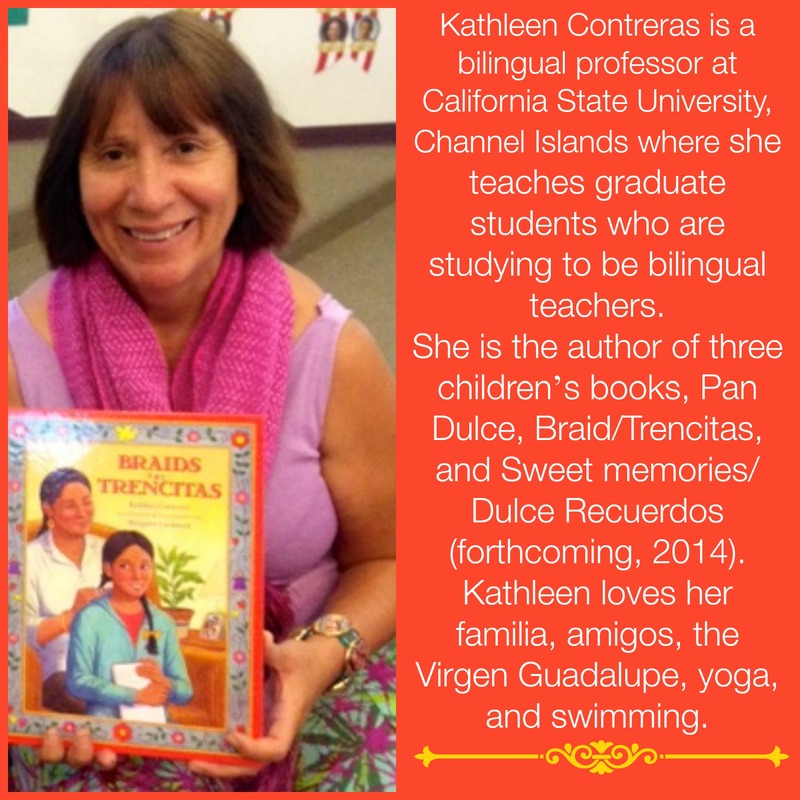 These special memories inspire the fictional stories in my two children’s books–Braids/ Trencitas and my soon to-be released book, Sweet Memories/Dulce Recuerdos, both published by Lectorum. I love paletas de cajeta! They are one of your Abuela’s favorites. Your Mamá loved paletas de chocolate or arroz con leche. Paletas taste like home. El sabor de mi hogar. Ah…such sweet memories! My books of everyday family life mirror the daily lives of young Latino children. These important life experiences need to be reflected in children’s literature, both for Latino children and to enrich the lives of all children growing up in a diverse multicultural world. By the way, my mother’s food may disappear quickly, but her kitchen memories–full of stories, familia, and delicious food, last a lifetime. ¡Que viva mi mamá, Lupe! ¡Y que vivan los frijoles y tortillas!